The Tennessee Valley Authority (TVA) is a federally owned corporation in the United States created by congressional charter on May 18, 1933, to provide navigation, flood control, electricity generation, fertilizer manufacturing, and economic development to the Tennessee Valley, a region particularly affected by the Great Depression. The enterprise was a result of the efforts of Senator George W. Norris of Nebraska. TVA was envisioned not only as a provider, but also as a regional economic development agency that would use federal experts and electricity to more quickly modernize the region's economy and society. TVA's service area covers most of Tennessee, portions of Alabama, Mississippi, and Kentucky, and small slices of Georgia, North Carolina, and Virginia. It was the first large regional planning agency of the federal government and remains the largest. Under the leadership of David Lilienthal ("Mr. TVA"), the TVA became a model for America's efforts to help modernize agrarian societies in the developing world. Wilson Dam, completed in 1924, was the first dam under the authority of TVA, created in 1933. The Tennessee Valley Authority was initially founded as an agency to provide general economic development to the region through power generation, flood control, navigation assistance, fertilizer manufacturing, and agricultural development, but has evolved primarily into a power utility. Despite its shares being owned by the federal government, TVA operates exactly like a private corporation, and receives no taxpayer funding. The TVA Act authorizes the company to use eminent domain. TVA provides electricity to approximately ten million people through a diverse portfolio which includes nuclear, coal-fired, natural gas-fired, hydroelectric, and renewable generation. TVA sells its power to 154 local power utilities, 5 direct industrial and institutional customers, and 12 surrounding utilities. In addition to power generation, TVA provides flood control with its 29 hydroelectric dams, which allow for recreational activities, and provides navigation and land management along rivers within its region of operation. TVA also assists governments and private companies on economic development projects. TVA has a nine member board of directors, each nominated by the United States President and confirmed by the United States Senate. The part time members serve five year terms and receive an annual stipend of $45,000 ($50,000 for the chairman). The board members choose the chief executive officer (CEO). The Tennessee Valley Authority Police are the primary law enforcement agency for the company. Initially part of the TVA, the TVA Police became a federal law enforcement agency in 1994. During the 1920s and the Great Depression years, Americans began to support the idea of public ownership of utilities, particularly hydroelectric power facilities. The concept of government-owned generation facilities selling to publicly owned distribution utilities was controversial and remains so today. Many believed privately owned power companies were charging too much for power, did not employ fair operating practices, and were subject to abuse by their owners (utility holding companies), at the expense of consumers. During his presidential campaign, Roosevelt claimed that private utilities had "selfish purposes" and said, "Never shall the federal government part with its sovereignty or with its control of its power resources while I'm president of the United States." By forming utility holding companies, the private sector controlled 94 percent of generation by 1921, essentially unregulated. (This gave rise to the Public Utility Holding Company Act of 1935 (P.U.H.C.A.)). Many private companies in the Tennessee Valley were bought by the federal government. Others shut down, unable to compete with the TVA. Government regulations were also passed to prevent competition with TVA. In the 1920s, a major battle erupted over building an electric power system in the Tennessee Valley, based on the World War I federal dam at Muscle Shoals, Alabama. It would generate electricity and produce fertilizer. Senator George Norris of Nebraska blocked a proposal from Henry Ford in 1920 to use the dam to modernize the valley. Norris deeply distrusted privately owned utility companies. He did get Congress to pass the Muscle Shoals Bill, but it was vetoed as socialistic by President Herbert Hoover in 1931. The idea behind the Muscle Shoals Bill in 1933 became a core part of the New Deal's TVA. Even by Depression standards, the Tennessee Valley was economically dismal in 1933. Thirty percent of the population was affected by malaria, and the average income was only $639 per year, with some families surviving on as little as $100 per year. Much of the land had been farmed too hard for too long, eroding and depleting the soil. Crop yields had fallen along with farm incomes. The best timber had been cut, with another 10% of forests being burnt each year. President Franklin Delano Roosevelt signed the Tennessee Valley Authority Act (ch. 32, Pub.L. 73–17, 48 Stat. 58, enacted May 18, 1933, codified as amended at 16 U.S.C. § 831, et seq. ), creating the TVA. TVA was designed to modernize the region, using experts and electricity to combat human and economic problems. TVA developed fertilizers, taught farmers ways to improve crop yields and helped replant forests, control forest fires, and improve habitat for fish and wildlife. The most dramatic change in Valley life came from TVA-generated electricity. Electric lights and modern home appliances made life easier and farms more productive. Electricity also drew industries into the region, providing desperately needed jobs. The development of the dams displaced more than 15,000 families. This created anti-TVA sentiment in some rural communities. Many local landowners were suspicious of government agencies, but TVA successfully introduced new agricultural methods into traditional farming communities by blending in and finding local champions. Tennessee farmers would often reject advice from TVA officials, so the officials had to find leaders in the communities and convince them that crop rotation and the judicious application of fertilizers could restore soil fertility. Once they had convinced the leaders, the rest followed. At its inception, TVA was based in Muscle Shoals, Alabama, but later moved its headquarters to Knoxville, Tennessee, where they remain today. At one point, TVA's headquarters were housed in the Old Federal Customs House at the corner of Clinch Avenue and Market Street. The building is now a museum. TVA was one of the first federal hydropower agencies, and today most of the nation's major hydropower systems are federally managed. Other attempts to create similar regional corporate agencies have failed, such as a proposed Columbia Valley Authority for the Columbia River in the Pacific Northwest. 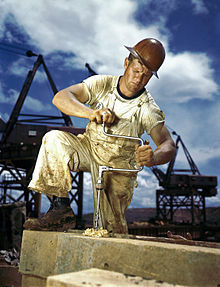 A carpenter (wearing a contractor's employee badge) at work during the 1942 construction of the Douglas Dam in East Tennessee. The Authority hired many area unemployed to conduct conservation, economic development, and social programs, such as a library service that operated for the surrounding area. The professional staff headquarters was composed of experts from outside the region. By 1934, TVA employed more than 9,000 people. The workers were categorized by the usual racial and gender lines of the day. TVA hired a few African Americans for janitorial or other low-level positions. TVA recognized labor unions; its skilled and semi-skilled blue collar employees were unionized, a breakthrough in an area known for corporations hostile to miners' and textile workers' unions. Women were excluded from construction work. TVA's cheap electricity attracted textile mills to the area, and they hired mostly women as workers. The Douglas Dam early in its construction in 1942. During World War II, the U.S. needed greater aluminum supplies to build airplanes. Aluminum plants required large amounts of electricity. To provide the power, TVA engaged in one of the largest hydropower construction programs ever undertaken in the U.S. By early 1942, when the effort reached its peak, 12 hydroelectric plants and one steam plant were under construction at the same time, and design and construction employment reached a total of 28,000. In its first eleven years, TVA constructed a total of 16 hydroelectric dams. The largest project of this period was the Fontana Dam. After negotiations led by Vice-President Harry Truman, TVA purchased the land from Nantahala Power and Light, a wholly owned subsidiary of Alcoa, and built Fontana Dam. Also in 1942, TVA's first coal-fired plant, the 267 megawatt Watts Bar Steam Plant began operation. The government originally intended the electricity generated from Fontana to be used by Alcoa factories. By the time the dam generated power in early 1945, the electricity was directed to another purpose in addition to aluminum manufacturing, as TVA also provided much of the electricity needed for uranium enrichment at Oak Ridge, Tennessee, as required for the Manhattan Project and the making of the atomic bomb. By the end of the war, TVA had completed a 650-mile (1050-kilometer) navigation channel the length of the Tennessee River and had become the nation's largest electricity supplier. Even so, the demand for electricity was outstripping TVA's capacity to produce power from hydroelectric dams, and so TVA began to construct coal-fired plants. Political interference kept TVA from securing additional federal appropriations to do so, so it sought the authority to issue bonds. Several of TVA's coal fired plants, including Johnsonville, Widows Creek, Shawnee, Kingston, Gallatin, and John Sevier, began operations in the 1950s. Coal surpassed hydroelectricity as TVA's top generating source in 1955. On August 6, 1959 President Dwight D. Eisenhower signed into law an amendment to the TVA act which made the agency self-financing. The 1960s were years of further unprecedented economic growth in the Tennessee Valley. Electric rates were among the nation's lowest and stayed low as TVA brought larger, more efficient generating units into service. Expecting the Valley's electric power needs to continue to grow, TVA began building nuclear reactors as a new source of cheap power. During this decade (and the 1970s), TVA was engaged in what was up to that time its most controversial project – the Tellico Dam Project. The project was initially conceived in the 1940s but not completed until 1979. Significant changes occurred in the economy of the Tennessee Valley and the nation, prompted by an international oil embargo in 1973 and accelerating fuel costs later in the decade. The average cost of electricity in the Tennessee Valley increased fivefold from the early 1970s to the early 1980s. TVA's first nuclear reactor, Browns Ferry Unit 1, began operation in 1974. In the early 1970s, TVA set out to construct a total of 17 nuclear reactors, due to a projection of further increase in power demand. However, ten of these reactors were cancelled in the 1980s. On August 6, 1981 the Tennessee Valley Authority Board voted to defer the Phipps Bend plant, as well as to slow down construction on all other projects. The Hartsville and Yellow Creek plants were cancelled in 1984 and Bellefonte in 1988. The 1970s saw the last and most controversial of the TVA's large dam-reservoir projects, Tellico Dam. The Tellico Dam project was initially delayed because of concern over the snail darter. A lawsuit was filed under the Endangered Species Act and the U.S. Supreme Court ruled in favor of protecting the snail darter in Tennessee Valley Authority v. Hill. Marvin T. Runyon became chairman of the Tennessee Valley Authority in January 1988. He claimed to reduce management layers, cut overhead costs by more than 30%, and achieved cumulative savings and efficiency improvements of $1.8 billion. He said he revitalized the nuclear program and instituted a rate freeze that continued for ten years. As the electric-utility industry moved toward restructuring and deregulation, TVA began preparing for competition. It cut operating costs by nearly $950 million a year, reduced its workforce by more than half, increased the generating capacity of its plants, and developed a plan to meet the energy needs of the Tennessee Valley through the year 2020. In 1996, Watts Bar Unit 1 began operation. This was the last commercial nuclear reactor to begin operation in the 20th century. In 2002, TVA began work to restart a previously mothballed nuclear reactor at Browns Ferry Unit 1, which was completed in May 2007. In 2004, TVA implemented recommendations from the Reservoir Operations Study (ROS) in how it operates the Tennessee River system (the nation's fifth largest). In 2005, the TVA announced its intention to construct an Advanced Pressurized Water Reactor at its Bellefonte site in Alabama (filing the necessary applications in November 2007), and in 2007 announced plans to complete the unfinished Unit 2 at Watts Bar. On December 22, 2008, an earthen dike at TVA's Kingston Fossil Plant broke, spreading one billion gallons of wet coal ash across 300 acres (1.2 km2) of land and into the tributaries of the Tennessee River. While TVA's culture at its fossil fuel plants was not the cause of the Kingston Spill, the culture contributed to the spill, as was noted in the TVA Office of the Inspector General's report, Inspection 2008-12283-02, Review of the Kingston Fossil Plant Ash Spill Cause Study and Observations About Ash Management. As of 2013, TVA carries $25 billion in debt, near the $30 billion debt limit imposed by Congress. In April 2011 TVA reached an agreement with the Environmental Protection Agency (EPA), four state governments, and three environmental groups to drastically reduce pollution and carbon emissions. Under the terms of the agreement, TVA was required to retire at least 18 of its 59 coal-fired units by the end of 2018, and install scrubbers in several others or convert them to make them cleaner, at a cost of $25 billion by 2021. As a result TVA has closed several of its coal fired power plants in the 2010s, converting some of them to natural gas. These include John Sevier in 2012, Shawnee Unit 10 in 2014, Widows Creek in 2015, Colbert in 2016, Johnsonville and Paradise Units 1 and 2 in 2017, and Allen in 2018. In October 2016 Watts Bar Unit 2 began commercial operation. Watts Bar Unit 2 is the first, and so far only, new nuclear reactor to enter service in the 21st century. In 2018, TVA opened a new cybersecurity center in its downtown Chattanooga Office Complex. Over twenty IT specialists monitor emails, Twitter feeds and network activity for cybersecurity threats and threats to grid security. Across TVA's digital platform there are 2 billion activities that occur each day. The center is manned 24 hours a day to spot any threats to TVA's 16,000 miles of transmission lines. Owing to continued economic pressure on the coal industry, the TVA board defied President Trump and voted in February 2019 to close two aging coal plants, Paradise 3 and Bull Run. TVA chief executive William Johnson said the decision was not about coal. but rather "about keeping rates as low as feasible." The TVA reported in public comments about the decommissioning the two plants that the action would reduce its carbon output by about 4.4% annually. The twin cooling towers and reactor containment buildings of TVA's Sequoyah Nuclear Plant north of Chattanooga, Tennessee. With a generating capacity of approximately 35 gigawatts (GW), TVA has the sixth highest generation capacity of any utility company. TVA's power mix as of 2018 is 6 coal-fired power plants, 29 hydroelectric dams, three nuclear plants (with seven operating reactors), nine simple cycle natural gas combustion turbine plants, nine combined cycle gas plants, 1 pumped storage hydroelectric plant, 1 wind energy site (plus contracts to purchase Midwest wind power), and 15 small solar energy sites. In fiscal year 2018, nuclear generation was about 40% of TVA's total, coal 26%, natural gas 20%, hydroelectric 10%, and wind and solar 3%. TVA currently purchases from external power producers about 15% of the power it sells. Purchased power is from natural gas combined cycles, coal, wind, and other renewables. The cost of Purchased Power is part of the "Fuel Cost Adjustment" (FCA) charge that is separate from the TVA Rate. Watts Bar Nuclear Plant produces tritium as a byproduct for the U.S. National Nuclear Security Administration, which requires tritium for nuclear weapons (for "boosted" fission primaries and for fusion secondaries). This page is based on the Wikipedia article Tennessee Valley Authority; it is used under the Creative Commons Attribution-ShareAlike 3.0 Unported License (CC-BY-SA). You may redistribute it, verbatim or modified, providing that you comply with the terms of the CC-BY-SA.